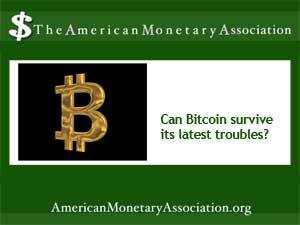 The Bitcoin, pioneer of the digital currency movement worldwide and once the darling of liberty lovers everywhere, has suffered some major setbacks in its march toward acceptance as a real alternative currency. But whether – and how – the Bitcoin weathers those rough spots may prove the true test of its staying power, as the recent suicide of a young Bitcoin exchange CEO seems to suggest. Theories about as to the real cause of these deaths. Some blame the intense pressure of legal investigations into unscrupulous banking practices by JP Morgan, Bank of America and others. Others speculate that these bankers had inside knowledge of a coming financial collapse, with echoes of the Great Depression of the 1930s, which saw numerous bankers leaping from windows and roofs. Still other theories point to the stresses of the fast paced financial world and a culture of success that won’t admit weaknesses such as depression or anxiety.